Device Characterization and Wafer Level Reliability - mb-techs Webseite! Using 1 to 6 SMUs a Parameter Analyzer from mb-Technologies is a very flexibel instrument for characterization of active and passive components in any laboratory. Larger systems are available on request. Many test algorithms for typical measurements are included! All test program's source can be modified by the user or used as a starting point for new algorithms. Settings for the test programs (like voltage steps, current compliance, polarity) are saved automatically. Work with maximum efficiency! Just define the measurement conditions, the characteristic curves to be measured and the parameters to be extracted and press Start! 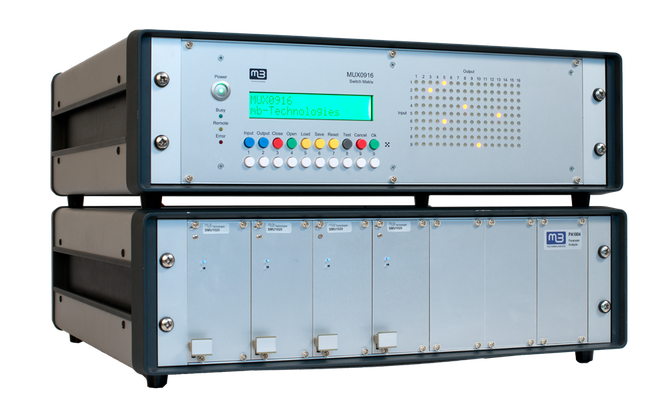 WLR (Wafer Level Reliability) characterization algorithms are included with every mb-Technologies Parameter Analyzer, however only one device can be measured at a time. 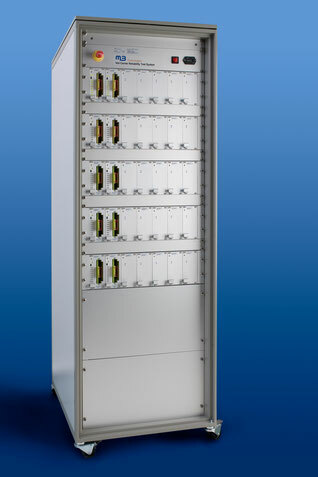 With the inclusion of a switch matrix the test capacity greatly increases as several devices can be stressed in parallel, thus resulting in a powerful WLR tester! Optional: Integration of a temperature chamber, interface to semi-automatic or fully-automatical wafer handlers, pulse unit for EEPROM endurance test.